Well that’s thinking outside of the orthogonal box! 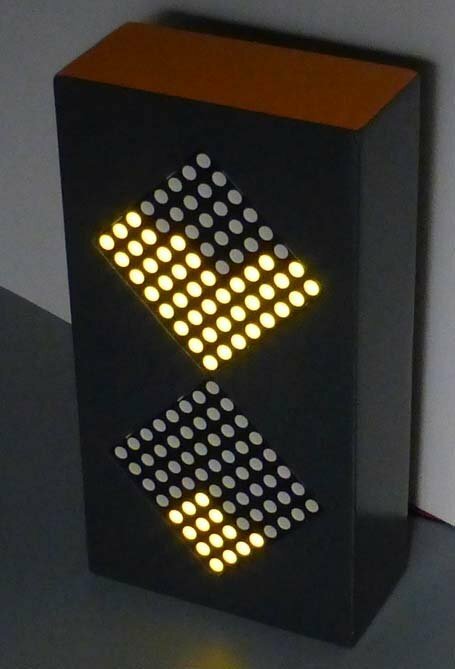 I like this, I might make one with an ATmega and some of those display drivers MAX7221 and perhaps 8 blocks. Nice project for a simple single sided PCB. I bet lots of people would buy this. This is the best hack I have seen in ages! I love it that much I think I’m going to build me one. I like that you can change the time the hour glass represents, this has to be the only improvement on a real hour glass since they were invented! And then add a Qi-charged battery in the box and the qi-transmitter hidden inside the desk and the display can show pretty patterns while not in use…. Amazing! How an idea so simple (turn the LED matrixes 45deg, and turn two of them into a sandglass) turns into something that looks absolutely gorgeous is totally genious. Want one! Agreed, nicely done, simple non-hacked displays but tilted and with a nice animation made to be something special. Yeah, did anyone check the license? 1) This software, as a whole or in parts, as well as any work derived from this software must only be executed on original fab4U hardware or used to control original fab4U hardware which has the fab4U logo on it.